I did a rave review of Galveston by Nic Pizzolatto not so long ago. (Scroll down, if interested, and hit "next" once or twice) Great noir novel with soul, wit, atmospherics and intelligence. Most noir stuff I've read lately dispense with the last four items. Be that as it may I stand by my statement that he's a (expletive) genius. Remarkable. And that's a BIG understatement. True Detective, the radiantly brilliant HBO series bangs that nail right into the pantheon hall of fame wall where they'll hang his certificate. True Detective is simply the best thing to grace TV, ever. HBO is to be congratulated. Best dialogue, best acting, best casting, best direction, best music, best costume design, best cinematography, best stuntwork, best catering probably, best Best Boy and Key Grip, I'd wager. Man, the total is just so far out there as to defy description. Film students, take note. Script writers listen up. This is the new shoot-for-the- moon aspirational bullseye. It gets no better. Someday when and if this blog gets some audience I will attempt to interview Mr. Pizzolatto. Anyone who could dream up nihiist Rust Cohle and make Marty Hart much more than a cardboard cutout Louisiana cop, has stuff to say, you bet. Those two: fire and ice, oil and water. The tension built up between Rust and Marty is as tactile and toxic as a freshly creosoted railroad tie. And Pizzolatto's mining of The King In Yellow, a 19th century horror story, as the basis for a cult within a cult, is as gothic as it gets in kudzu country. If you haven't seen it, do yourself a big ol' solid favor and get the series on disc. You'll watch it more than once. If you've seen it, you know what I'm talking about, because you want to see it again, don't you? See it once for dialogue, once for story, once for acting (McConaughey and Harrelson are Su-freaking-PERB!) once for...on and on. It's The Best. An edgy look at the present in future tense, or something like that. 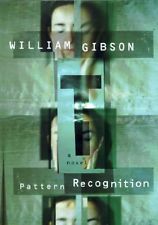 Pattern Recognition by William Gibson is really really good, blew me away actually,-- not like True Detective and Galveston. But it still elicits "wow's" and sky-looks every few pages. The story is rather wonderful--a hot girl who is allergic to the point of hives and anaphylaxis to fashion logos, a mysterious set of film snippets that may be the doing of a genius/auteur that pops up in odd places online frame by frame, the machinations of an evil ad agency CEO and his minions, and the hot girl's shadowy father, almost certainly lost in the Twin Tower horror, but present as a sort of spiritual advisor. This thing whipsaws you from Paris to Tokyo to London and Moscow, back to the USA and whirls you about while showing you a travelogue immersed in detail and fine points enough to make you think you know these places. Masterful. And great fun. Five stars on the Amazon scale, easily, while TD and Galveston get Ten. Gardening and boxing prepare a guy for detecting? First off, and least, Amazon ordered two more copies of Night Train,Cold Beer! Must've been a run on it. Joke, son. The real news is, (1) Ruined Days, the novel, is in edit rounds at the publisher. (2) That same publisher issued a contract for Resume Speed, a collection of short stories, that, unlike Night Train, will look like an actual book and not something typeset in WWI Minsk, and another novel, L.A.Hardscape, is slated to be done in April--and, who knows, it may also get a publishing contract. It's an oddball private eye story, about an ex-Notre Dame champ who has to quit the fight game in Los Angeles due to mob meddling, so he takes up gardening to pay the rent. He's good at it. But he also scored high on LAPD's rookie on-the-street training before he quit that for the earlier re-entry into boxing. Page one he gets into it with a mob enforcer and off he goes. He meets a ravishing older woman in Brooks Brothers on Rodeo Drive and off he goes again, but she disappears and leaves him holding his bags of compost and rakes in a mansion in South Bay plus he's being pursued by someone just as mysterious. Should be done in April. Resume Speed should be on shelves in 2015, along with Ruined Days.